interacto.net - UNO 1.5 Unleashed! To celebrate the maturity of our beloved "Cat" (Tiger 10.4.9!) we present you a completely new UNO! This is a total rewrite of UNO, featuring a brand new UI and a ton of new GUI options. Some annoying glitches like the "long-standing" QuickTime bottom corners problem is finally fixed. 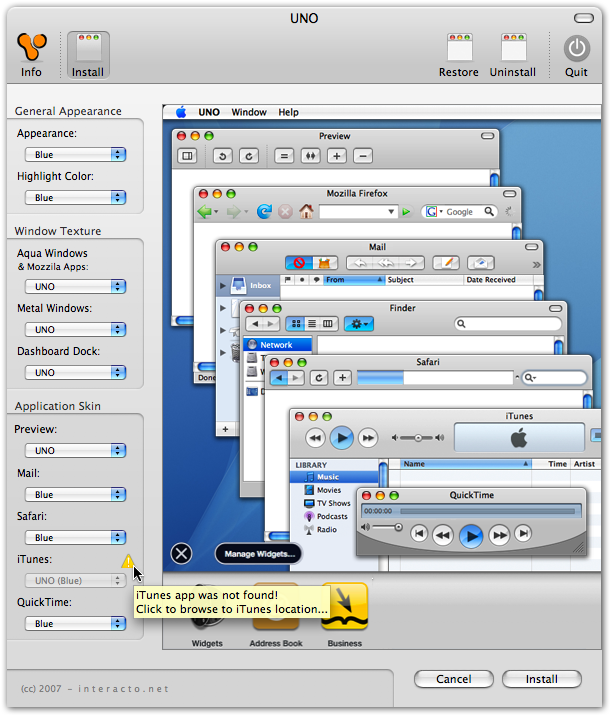 This build brings coherency to the Blue/Graphite duality of Mac OS X GUI. Go to System Preferences and select Graphite in the Appearance panel. Now open the Finder and select a item in the sidebar - What? It remains Blue? Go to Users pane in SysPref and select a User - Correct, it remains Blue. Now open Safari and click a toolbar button - You're right, it remains Blue also.. Tried it? Find it annoying? Fear not! 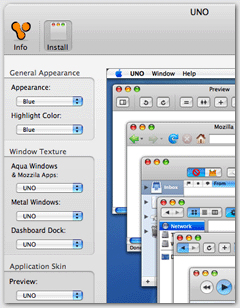 UNO is here to fix Mac OS X inconsistencies and now it fixes this one too. A big thanks to Gerrit for all the application skins included on this build and for the outstanding support to this project!